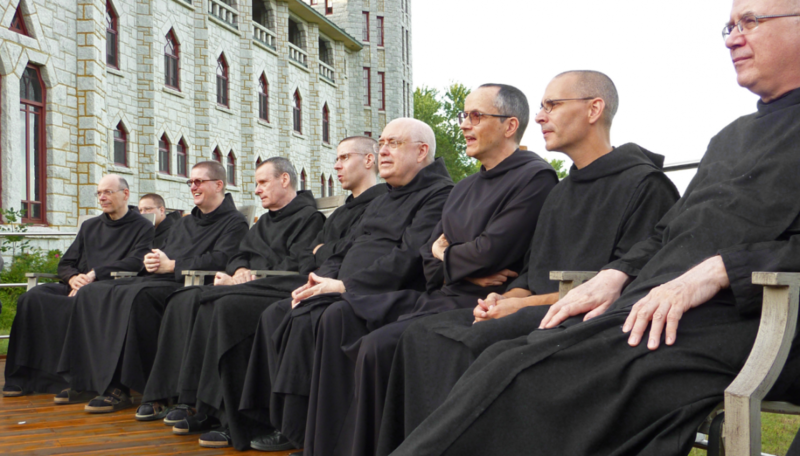 We are a Benedictine community of about 30 monks living under the Rule of Saint Benedict. We share the same ideals, and every member of the community is encouraged to share his talents and skills in order to build a community faithful to the Gospel. God called us to the monastery: we did not choose our brothers, but we choose to love them despite differences of personality or opinion. We believe that Christ is present in each of our brothers, and that love for God and for our brothers are inseparable. 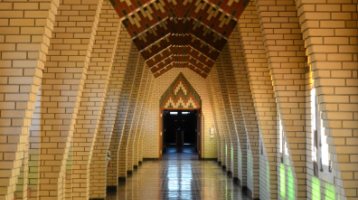 Silence in the Abbey encourages us to meditate and allows us to deepen our relationship with God. However, we share daily moments of conversation and relaxation to promote fraternal life. The abbot represents Christ in our midst, and by his example and teaching, he helps and encourages us to persevere in our chosen path. He has to adapt to everyone’s personality and moods. He is elected by the community. 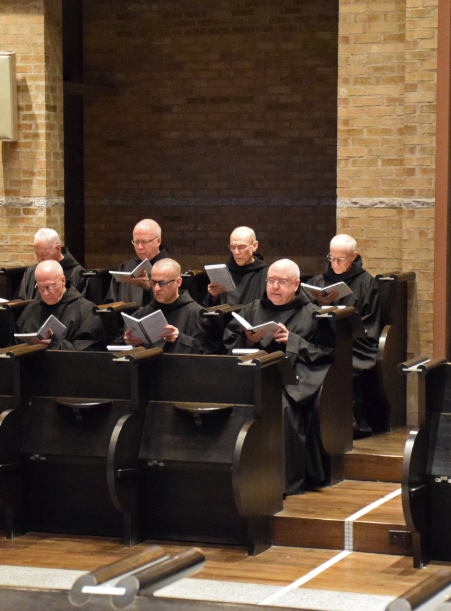 For major decisions, the abbot convenes the entire community, because St. Benedict remarked “the Lord often reveals to the younger what is best” (ch. 3). He must adapt himself to everyone’s personality and moods. He handles less important matters with the members of a council, of which some were elected by the community. Some nights, before Compline, we meet together in the chapter room to hear our Abbot comment on the Rule, or to rehearse the chants for the coming days. Our days are not as mysterious as one might imagine. Mostly, they are well-regulated and very precise. Our day is divided between the Divine Office and periods of reading, relaxation and manual and intellectual work. Learn more about our peaceful, prayerful and silent way of life. The bell rings at regular hours calling us to celebrate together the Liturgy of the Hours*, also called the Divine Office. This is the foundation of our community, and where it allows itself to be transformed by the message of Scripture. United with the Church, we praise the Lord and intercede for the needs of all our brothers and sisters in humanity. These moments of community prayer set the rhythm of our day. They are comprised mainly of Psalms, but also hymns, canticles and Bible readings. Our day’s summit is the celebration of Mass. That is where we become one Body with Christ by sharing His Body and His Blood. A large portion of our celebrations are sung in Gregorian chant, which is traditionally considered to be the proper music of the Roman liturgy. Its spartan music encourages prayer and serves to emphasize the text. Personal prayer is intimately connected to the Office, whether to prepare for it or to prolong it. We manage to set aside time in our day so that this intimate prayer with God is renewed. In fact, we never really pray only at specific moments. Through all our activities, we strive to live under God’s gaze. These Latin words can be translated as “divine reading”. It consists of a slow and meditative reading of God’s Word while listening to God’s Spirit, which illuminates the text. 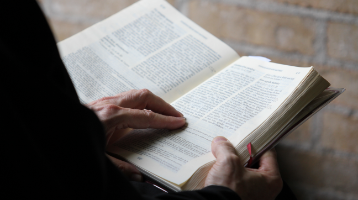 This prayerful manner of reading the Bible has been a Church tradition since the earliest centuries, particularly in monasteries. Lectio Divina can also be done with other texts such as the writings of the Church Fathers* or the spiritual commentaries of other authors. Work is essential to life. It maintains balance between mind and body, and connects us to the Creator’s work. Saint Benedict asks us to accomplish our work with humility, obedience and in the presence of God. He also recommends that the abbot ensure that nobody is overworked. For us, work is a way to ensure our subsistence and to share with the less fortunate. 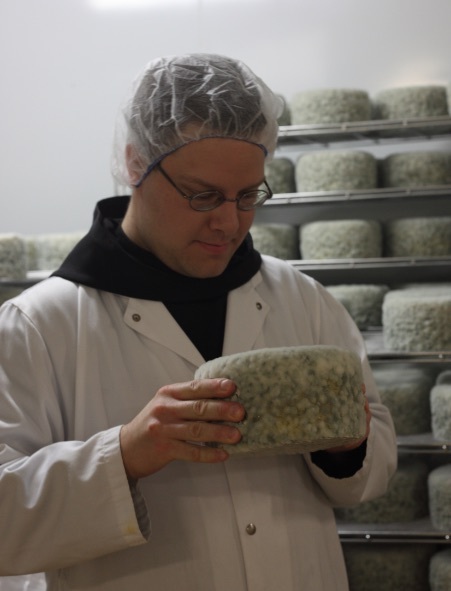 In addition to our crafts and profitable activities (cheese factory, cannery, cider production, gift shop), some work is essential to a smooth running monastery: accounting, refectory, guesthouse, library, infirmary, sacristy, etc. Furthermore, intellectual work is also important: reading and studying allow us to deepen the meaning of our lives. Lastly, artistic work is also a significant part of our monastic life. 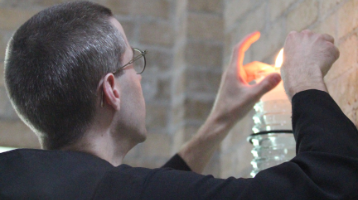 St. Benedict invites us to take care of everything and to consider “the monastery and all its possessions as if they were sacred vessels of the altar” (ch. 37). Of course, this also means being respectful of nature and the environment. The Office of Vigils (50 minutes, a little bit longer on Sundays and holidays). Celebrated at the end of the night, this Office evokes our wait for the Lord’s return. It consists of psalms and readings from the Bible and the Church Fathers*. 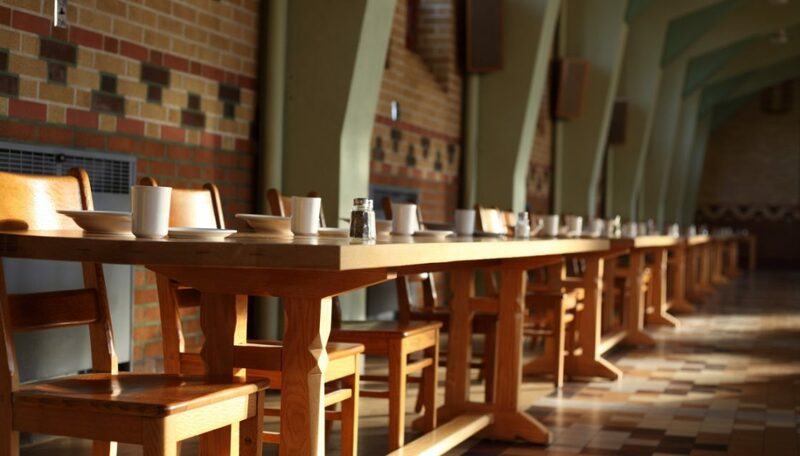 The time after Vigils, is dedicated to personal prayer, spiritual reading, and breakfast. Lauds (35 minutes), which means praise. This office evokes the Resurrection of Christ and signals the beginning of the day. Morning, which is divided by the short office of Terce (10 minutes), is the time of the day where we carry out the intellectual or manual work that is assigned to us. Young monks in formation attend spiritual conferences this time. Mass (50 minutes, 1 hour 15 on Sundays and holidays). This memorial of Christ’s Passion is the summit of our day. The mass is concelebrated and sung in Gregorian chant. The office of Sext (15 minutes), followed by lunch and a short period of free time. We eat in silence while a lector reads out loud. Afterwards, we do the dishes together. Everybody returns to their work. Vespers (35 minutes). We give thanks for the blessings of this day. This Office has the same structure as Lauds. The hour before dinner is devoted to Lectio Divina*. The meal is shared in silence while the lector reads. After dishes, we relax together. Compline (20 minutes). This office is the last prayer of the evening and ends with a chant to the Mother of God. As the final office of the day, it marks the beginning of the Great Silence that lasts until Lauds the following day. It is occasionally preceded by a meeting held in the chapter room. LITURGY OF THE HOURSChristian prayer sanctifying the various hours of day and night, whose structure was developed by the Church. CHURCH FATHERSTheologians of the first Christian centuries whose writings and pastoral action have enabled the elaboration of Christian thought and liturgy. LECTIO DIVINAMeditative and prayerful reading of Holy Scripture or a spiritual text. 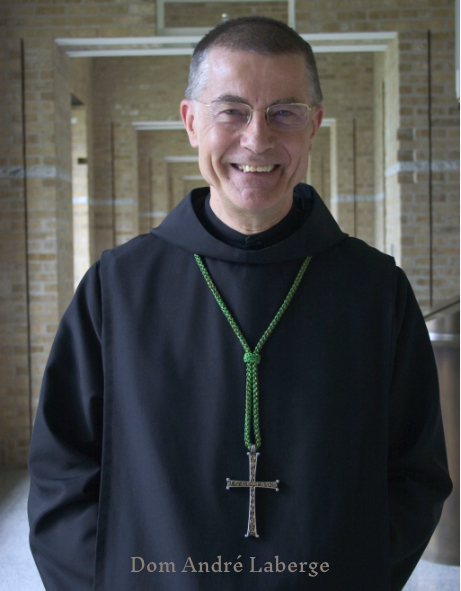 How do we know if we are called to monastic life? God uses a variety of ways to let us know His will. 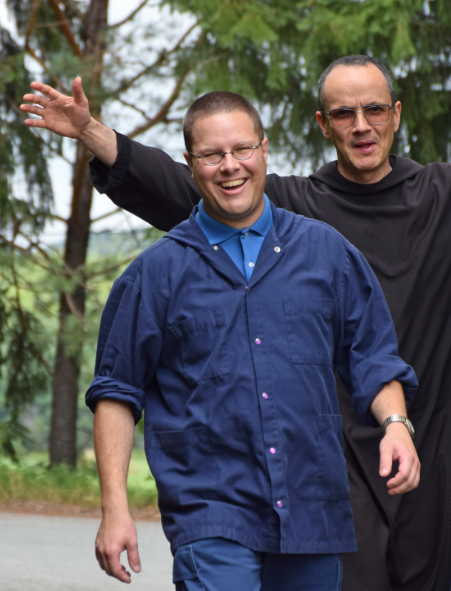 Monastic life is a long path, and Saint Benedict ensures that our heart expands as we advance along it. We thus strive to follow the counsels he gave to us. The Abbey welcomes everyone, whether you are a believer or not. People looking for peace and quiet to pray can stay at our guesthouse.